Ludhiana: A simple logic is at work in north-west Punjab: If men are scarce, call in the machines. 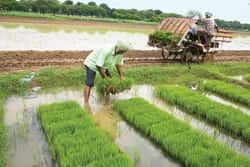 The Punjab State Farmers Commission (PSFC)—that advises the state government—and Punjab Agricultural University (PAU) are driving pilot projects in tandem to demonstrate the feasibility of transplanters that help sow rice saplings in a region that faces an acute shortage of labourers and a consequent rise in wages. “The response has been tremendous as farmers now have an alternative to labour, which is not only costly but also unpredictable," says Jaskaran Singh Mahal, senior research engineer at the department of farm power and machinery at the university, where experts now daily demonstrate the use of rice transplanters supplied by PSFC. The pilot projects are using a few transplanters the commission owns, including one of the two machines imported from Japan five years ago. “The technical people managed to fix the spare parts from one machine into the other to ensure that at least one is in working condition," says P.S. Rangi, consultant with the commission. Currently, Mahal is busy demonstrating two models to farmers: one costing Rs8 lakh and the other Rs1.65 lakh. “While the cheaper model may be picked up by large farmers on their own, the larger model will essentially have to be supplied through a cooperative system," says Rangi. PSFC is buying six more transplanters from China, which it will despatch to various parts of the state. When it bought the older machines from Japan for Rs8 lakh apiece, it was not economical to use them since the labour costs were cheaper. Things are different now. Officials from the university also demonstrate the usefulness of the machines to bureaucrats and politicians, hoping that they would provide the required policy push for mechanization. “The cost of operating the machines is much lower compared with the current cost of labour," says Mir Gowhar of VST Tillers Tractors Ltd, a Bangalore-based company that imports rice transplanters. “This is providing the impetus for us to focus on Punjab." While Ludhiana is the main demonstration centre, similar exercises are under way in Sangrur, Patiala and Amritsar as well. Rice-harvesting is already mechanized across the state. It is the sowing of rice saplings that is still done manually. Labour shortage in Punjab may just change that.